Posted by raznprince in League News, Pokemon News, Pokemon TCG, Pokemon Video Games. Worlds will be held on August 15-17 in Washington D.C. You must have attained the requisite Championship Points and received an invitation to participate. If you are attending the Last Chance Qualifier, you should have already pre-registered. League session (August 16) will be available on this weekend for those who cannot attend Worlds. You are also encouraged to follow along the action online by clicking here. Congratulations to our Delphox LC Winners! A great showing of 22 players total attended, and a big thanks to our LC Staff Tony Fall and Stephanie Matta for helping us make this event run smoothly! Two exciting TCG formats revealed for the 2014-2015 Play! season! All cards that conform to Standard format are also legal in the Expanded format. These formats will take effect on September 3rd. League Challenges can be run in either the Standard or the Expanded format at the Tournament Organizer’s discretion. Starting with Fall Regionals, 2-day split tournaments will feature Standard on Day 1, and Expanded for players who make Day 2. 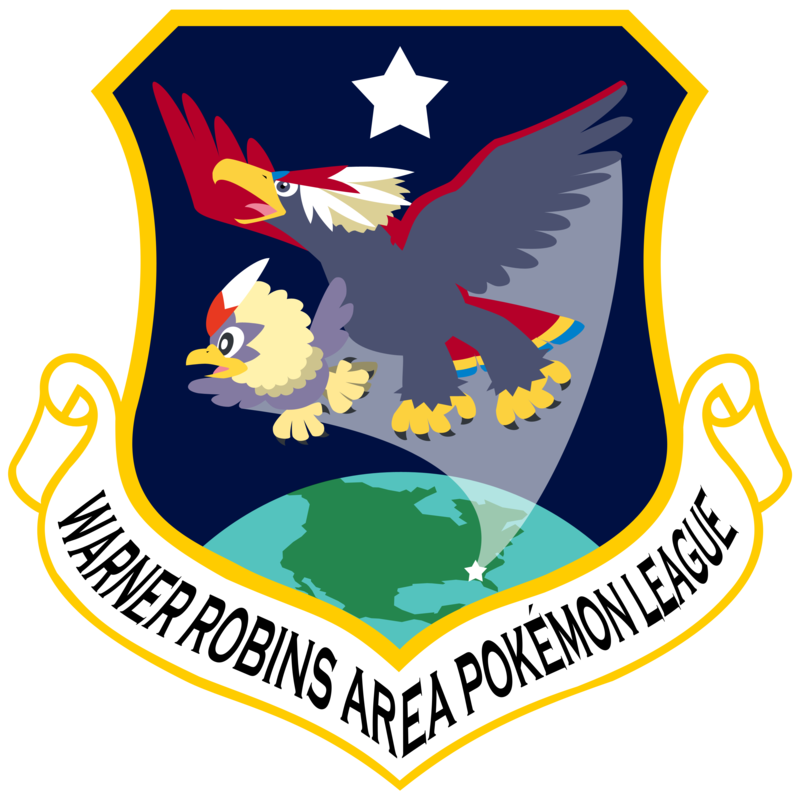 League Challenges for Warner Robins have been scheduled! LCs will be held at HV, so please be sure to arrive on time for registration (11-11:30 A.M.) Completed decklists will be required as this is a Premier Event. All players will receive one (1) Play! Point and a booster pack of the most-recent set for participating. Click on the Tournaments tab for more information. Furious Fists release on Wednesday, August 13th! Please be reminded that new sets are not legal for tournament play until 3 weeks after their release date. For Furious Fists (FFI), they will be tournament-legal on September 3rd. The Pokémon Center is now open for business! Now you can shop for awesome gear from your beloved game! Go to pokemoncenter.com for all the latest goods. New League Prizes for the Kalos Pokémon Cycle! With each line you complete on your tracking card, you earn a promo card plus a PTCO league code card. When you complete your tracking card, you also earn a charm respective to the card you completed! Gen III Pokémon has been remade and will feature two exciting versions, Omega Ruby and Alpha Sapphire, to be released in November. Lots of Mega Evolutions and remade features have been revealed on pokemon.com! If you have a Facebook account, and would like to join the group and get League news and updates that way, click here. We’ll gladly accept new members to this group, even if you’re not or no longer from the area! We kindly ask that you please not post spam or any unconfirmed Pokémon rumors/spoilers once accepted. Keep up with all Premier Events happening in GA! Also, for all you Facebook users, you are highly encouraged to join the GA Pokémon Events group by clicking here. Updates are made weekly, and your questions are answered by the GA Pokémon staff and players alike. I will continue to post events on the blog’s Tournaments tab that coincide with the information contained there as a secondary source for you to search as well. 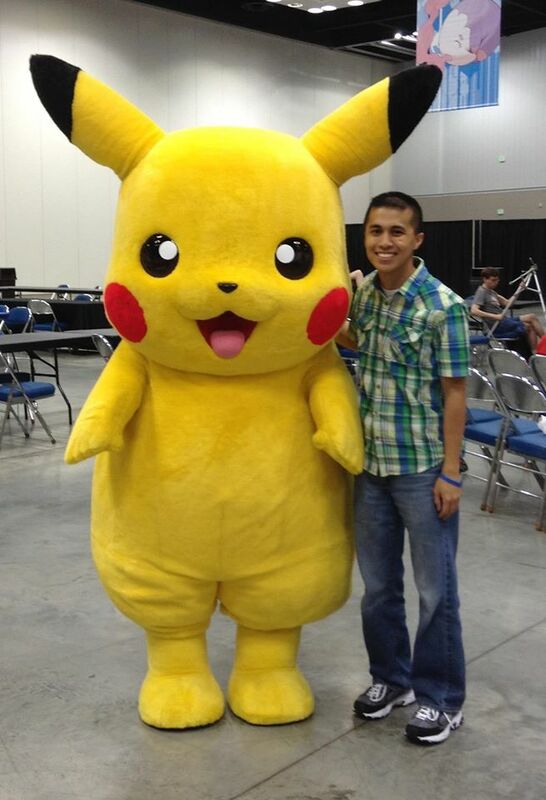 For other sanctioned events anywhere in the U.S., please go to www.pokemon.com. Let me know if you have any questions, and I wish success to all the back-to-school’ers! Posted by raznprince in Ask a Professor. It’s almost that time again…U.S. Nationals! Whether you are preparing to attend this year or are generally interested in attending in the future, this article will give you some insight on what to expect. I will show a few pictures from my photo album from 2013 U.S. Nationals in Indianapolis, IN. Just…how big is Nationals, really? 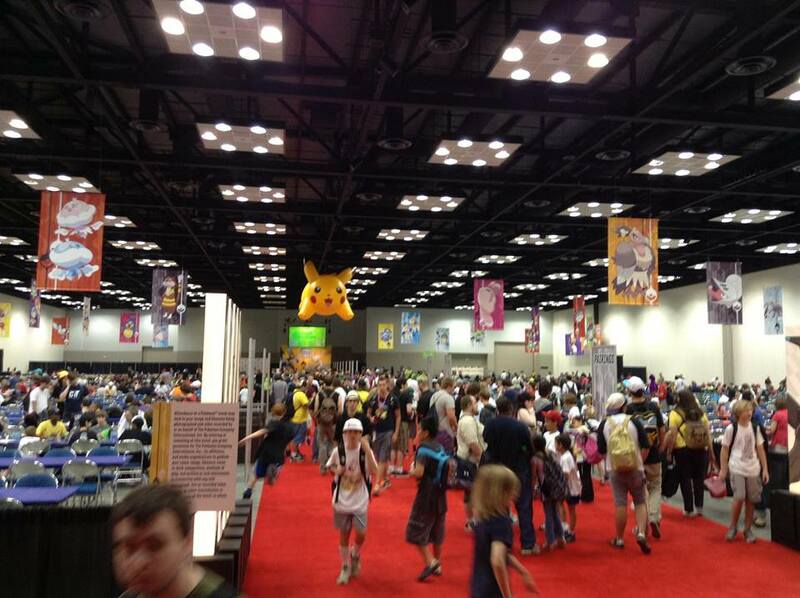 It is held in a huge hall at the Indiana Convention Center. 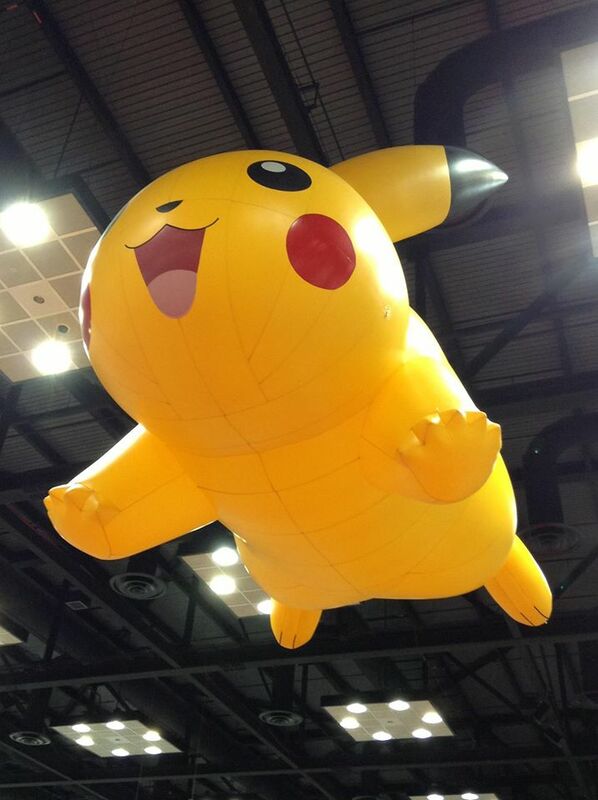 It’s the big party every Pokémon player from across the country should strive to go to and celebrate with all sorts of fun activities they have to offer over a three-day weekend. From blow-up Pokémon displays, to game tournaments, to costumed appearances and cosplayed fans, there’s something for everyone here! Usually around late June/early July timeframe. What is the Nationals Tournament like? It is the biggest tournament and the biggest chance for all good players to meet, compete, have fun, and battle for Championship Points and invitations to the World Championships! For TCG and comparable amounts of the VGC, Junior Division attendance tends to be around 150-200, Senior Division around 250-350, and Master Division can reach upwards of about 1,000 players! 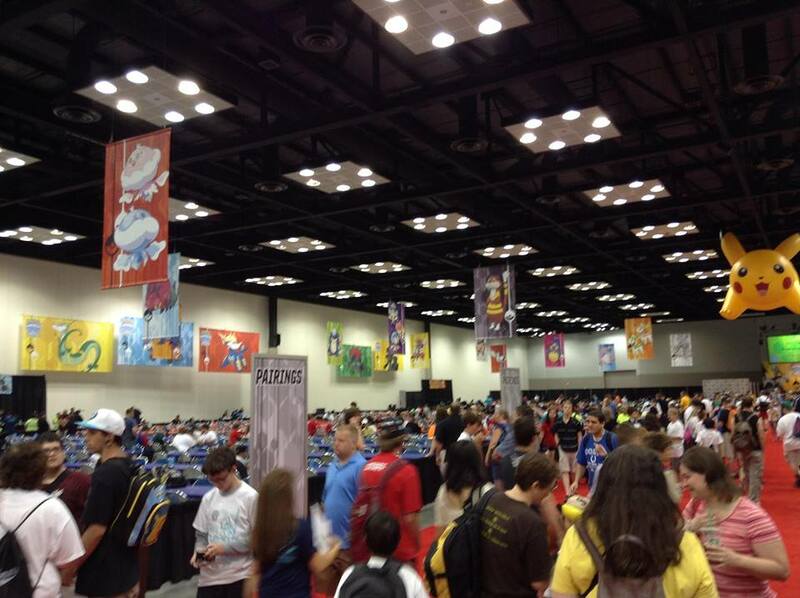 Registration Day: Thursday, everyone that come early can check in to register for the TCG and/or VGC tournaments. Those who pre-registered and check in will receive a Nationals T-shirt, a Nationals-stamped promo card. There will be open gaming in the rooms across the hall to get your last-minute practice in and tweak your decklists as necessary before Day 1. Vendors will be open to buying and selling Pokémon goods. This is a great first opportunity to get together with friends across the country that you normally wouldn’t see on a regular basis, whether you’ve met them at another tournament or League far away from home. Day 1: Friday is usually dedicated to TCG Nationals, where the players will play several Swiss rounds to determine if they can continue into Saturday or drop from the tournament. All players that complete two (2) Swiss rounds of TCG will receive ten (10) additional Play! Points for participating. All the while, small events and special guests and costume appearances are also taking place throughout the day. Professors who qualified for and registered for the North America Professor Cup will play in a few Swiss rounds in the evening. Day 2: Saturday tends to be the busiest day while TCG continues their Swiss rounds for the day and then plays a few rounds of Top Cut through Top 32 for all age divisions. VGC will be playing their preliminary Swiss rounds in parallel, and more special promotions, tournaments, and appearances are happening throughout the day! More Swiss rounds of the Professor Cup are played in the evening. Day 3: Like the Super Bowl, championships happen on Sunday here! TCG and VGC plays through their Top Cut rounds until Champions are decided, and the Professor Cup Top Cut will be happening in parallel. All Championship matches (Top 2) will be featured on the big stage for all to see! What can one win for doing well in the Nationals tournaments? TCG: Quarterfinalists will earn invitations to attend the World Championships, Top 4 players will earn trophies, and great Pokémon merchandise. Championship Points and booster packs of the current set may be awarded as low as the Top 128 level, but ultimately depending on respective division attendance. 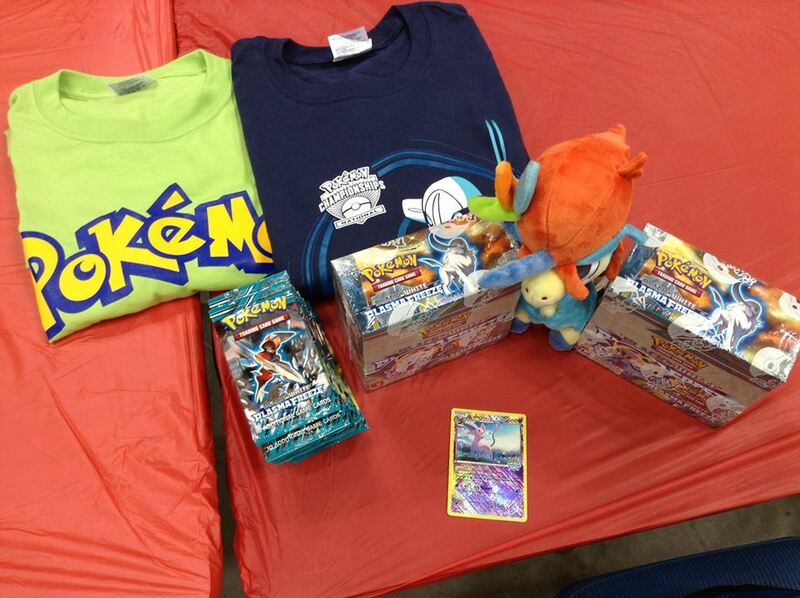 VGC: Top 4 players will earn trophies and invitations to Worlds, and great Pokémon merchandise. 2nd-4th place will win Nintendo 3DS-XLs and the Champion will win a 32GB Nintendo Wii U. Championship Points may be awarded as low as the Top 128 level, but ultimately depending on respective division attendance. See Nationals information under the Tournaments tab for complete information. I am going to Nationals this year! What should I expect that could be different from previous years? -TCG players will play 50-minutes Best 2-of-3 Swiss Matches on Days 1 and 2 and will cut to a Top 8. -VGC Nationals will feature battling through the X/Y versions. -U.S. Nationals will feature two Championship Point Challenge tournaments throughout the weekend as way for players to get in another chance to earn Championship Points for the Worlds invitation. They will feature Swiss rounds only and CPs will be awarded based on final standings per the Regional Championships CP distribution. Registration is $20 and entrants will receive a U.S. Nationals limited edition playmat. Can I still go to U.S. Nationals even if I don’t meet the TCG Play! Points requirements for this year? YES!!! I will repeat that there’s something for everyone at Nationals. If/While you won’t be eligible to play in the Nationals tournament, there’s no shortage of activities to enjoy while you’re there. What is all there to do over the weekend? VGC Nationals: There is no Play! Points threshold in order to participate in the VGC. Assemble your best VG team and battle for the Championship! Be sure that you have registered beforehand! Mini-League: This isn’t your ordinary League Session that you’re used to going to every week(end)! Find a player, battle them to a game and get in line for prizes. When you get to the front of the line, the League coordinators will reveal two prizes you can get. The winner gets first choice and the loser gets the other. The prizes are completely random, so you never really know what you can win until you get to the front of the line, so it’s best to be the winner of your game. Once you get your prize, find more players to battle, and rack up more prizes! Sample prizes can be anywhere from pencils, deck boxes, League and Premier Event promo cards, booster packs, and maybe even a booster box! Side Events: Throughout the weekend, there will be several tournaments you can participate in order to win some great prizes. 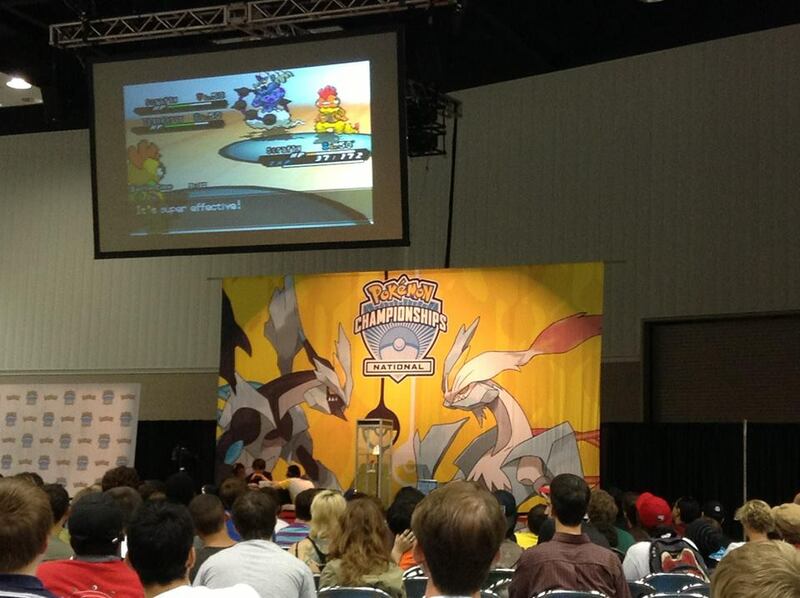 Such tournaments include 8-player knockout tournaments, 32-player Swiss, and 64-player Swiss TCG and VGC events. Brush up on your gaming skills, assemble your best deck or VG team, play against other players, and win more stuff! Who knows…big prizes like a Nintendo 3DS could be up for grabs! Special Costumed Appearances: Costumed Pokémon will make appearances throughout the weekend and are the perfect opportunity to get photos with friends, family, and yourself. Make those memorable moments count! Special Video Game Pokémon Distribution: While made available during Day 3, if you bring your Nintendo 3DS/3DS-XL with a (then) Black 2/White 2 version, you can receive a special Pokémon distribution that you can only get at Nationals! 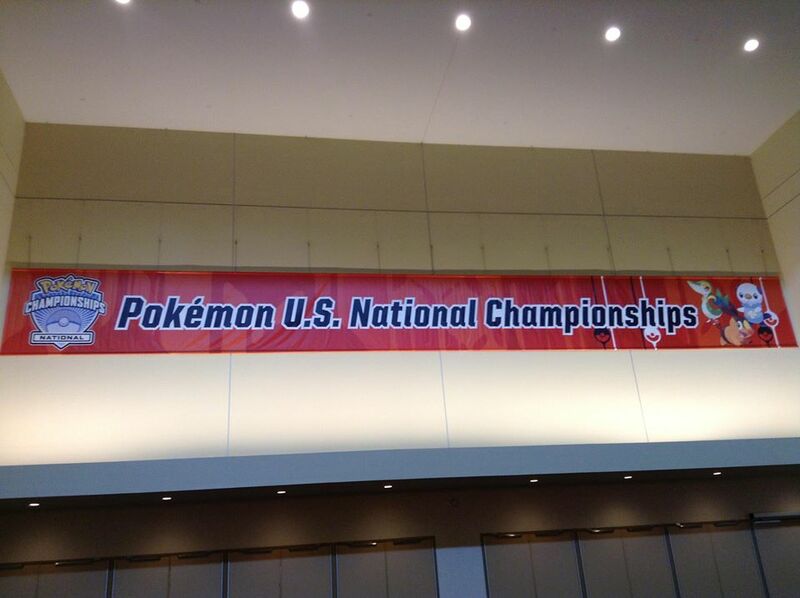 Update: 2014 Nationals is offering a distribution via X/Y versions of the game. Creativity Corner: Coloring activities are available to the younger groups in an area where parents can also be to spend that quality time with their child(ren) or wait on their child(ren) who may be playing in the Nationals tournaments. There may even be creativity contests where you could win prizes for having the best art! Street Pass City: For those of you with a Nintendo 3DS/3DS-XL, prepare to be inundated with multiple Street Passes throughout the whole weekend. It’s a great opportunity to fill up missing puzzle pieces, get those missing colors to help get through Find Mii-2 and other Mii Plaza games you may own, share data from other games you have allowed via Street pass, and much more! Shopping and Vendors: Looking for that certain card you need for your deck or collection? Or how about that Pokémon plush you’ve always wanted to get? Or a gift or souvenir for yourself or a friend? Looking to sell some cards? 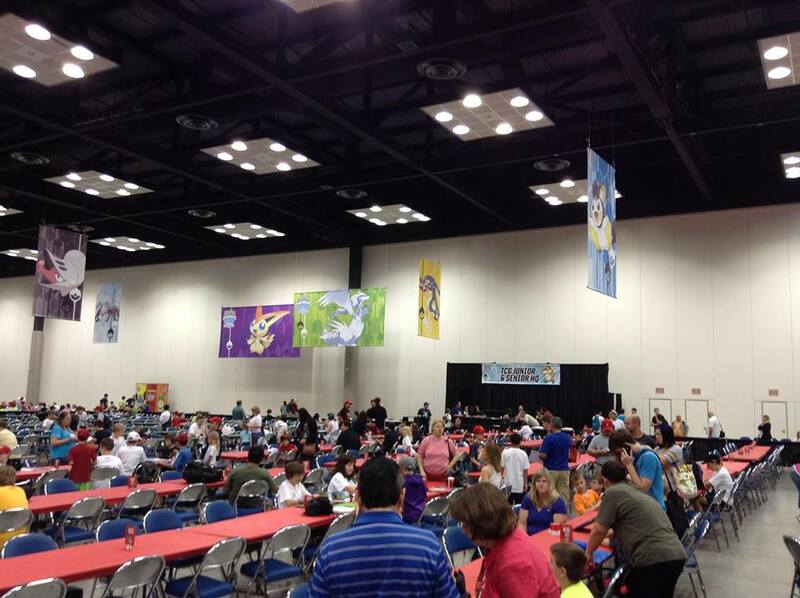 There will be some nationally-known vendors in attendance to help meet your Pokémon shopping needs. 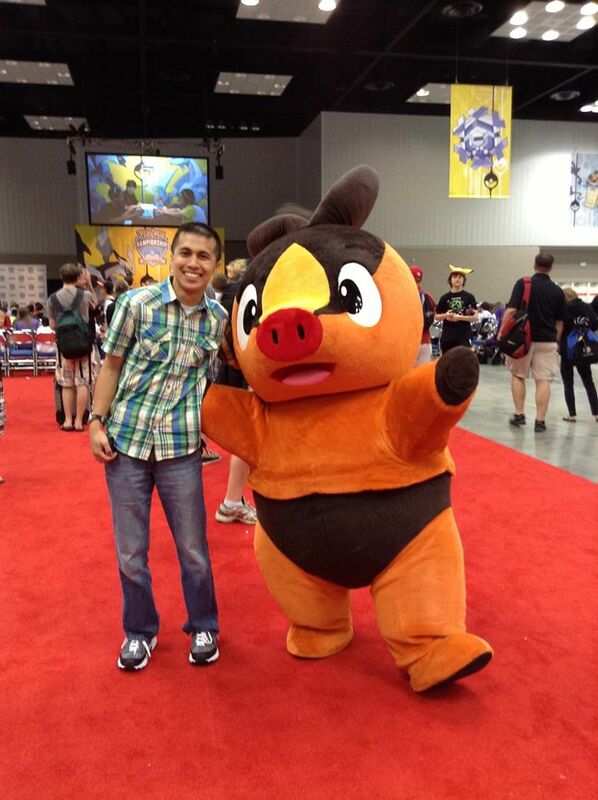 Volunteer Work: The Pokémon Company staff is always looking for help throughout the weekend. You can act as a runner and take up and submit match slips during the Nationals tournament, judge in Side Events or assist in Mini-League, and more. That’s not to say that your hard work and dedication won’t be well rewarded; you will receive booster packs of the current TCG set per hour that you work (or 1 pack every certain number of minutes), and a Staff-stamped Nationals promo card (and possibly more). You even get to keep the “Volunteer” T-shirt you wore while working! Your contribution to a smoothly-run event, no matter how small, will be greatly appreciated! Nearby Hangouts: Summertime in down Indianapolis can get very busy, not to mention hot and humid outside. The Skywalk is a convenient network of overpasses linked between the buildings to allow ease of access without having to wait outside at crosswalks. From the Convention Center, it is a very short walk through the overpass to get to other buildings and parking lots, including the Circle City Mall (popular spot to go get lunch during the day and do some shopping), and hotels you may be staying around the area. There are also plenty of shops and restaurants alongside the large buildings if walking outside is a must. When in doubt, follow the crowds! U.S. Nationals is a big event I highly recommend attending at least once in your lifetime. I am providing the link to the complete album found on Facebook . Please let me know if you have any more questions about U.S. Nationals! Hope to see you there this year! Nationals will be held on July 4th weekend in Indianapolis, IN. JR/SR TCG players must have earned 5 Play! Points to participate. MA TCG players must have earned 10 Play! Points and pay a $30 entry fee to participate. There is no Play! Points requirement or entry fee for all players to participate in the VGC tournament. Click on the Tournaments tab for more details. League session (July 5) will be available on this weekend for those who cannot attend Nationals. If you will be attending this year, make your plans NOW!!! You must pre-register in order to participate this year whether you are playing in the TCG, VGC, or both. Masters TCG players must pay the $30 entry fee online. Click on the Tournaments tab for the pre-registration links. Pre-registration closes at 9 P.M. on July 3. Please don’t miss out if you will be participating! Put your best TCG deck and/or VGC team to the ultimate test! VGC Nationals will feature play using the X/Y versions. If you will be attending, please read up on the current VGC format to help you prepare your team. Information can be found under the Tournaments Tab. Congratulations to our Chesnaught LC Winners! A great showing of 24 players total attended, and a big thanks to our LC Staff Tony Fall and Stephanie Matta for helping us make this event run smoothly! Gen III Pokémon has been remade and will feature two exciting versions, Omega Ruby and Alpha Sapphire, to be released in November. XY: Furious Fists Pre-Releases scheduled in GA! Furious Fists will feature fighting Pokémon entering the fray with newer EXs and Mega Evolutions. Release date is August 13, and the set will be tournament legal on September 3. See Tournaments Tab for details. Worlds 2014 will be held in Washington D.C.! This is a great opportunity for you to experience the World Championships on the East Coast this year. If you want to play for an invite or see what it’s like or take in the sights and sounds of the area and venue, start planning NOW!!! 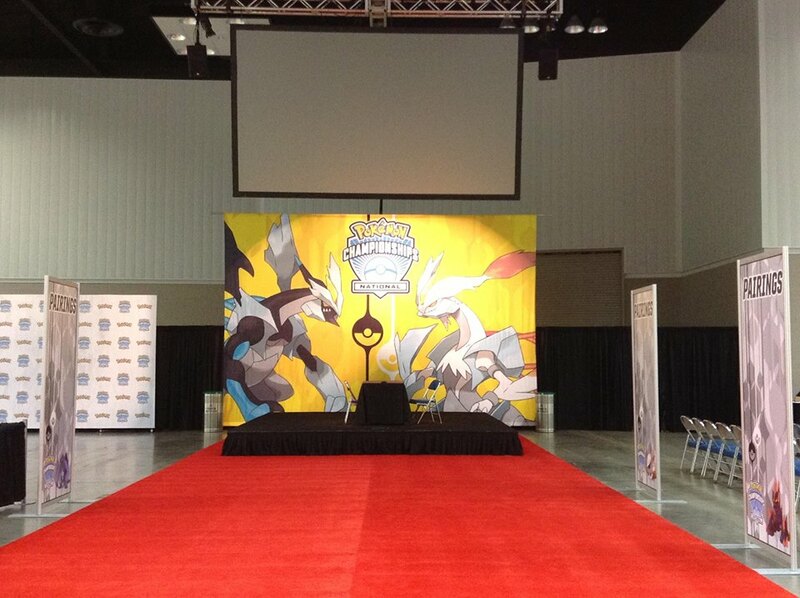 Worlds will be held at the Walter E. Washington Convention Center. Let me know if you have any questions, and I hope you are having a wonderful summer! Congratulations to our Yveltal LC Winners! A great showing of 17 players total attended last Saturday, and a big thanks to our Judge Tony Fall for helping us make this event run smoothly! LCs will be held at HV and be sure to arrive on time for registration (11-11:30 A.M.) Completed decklists will be required as this is a Premier Event. All players will receive one (1) Play! Point and a XY Flashfire booster pack for participating. Click on the Tournaments tab for more information. Furious Fists will feature fighting Pokémon entering the fray with newer EXs and Mega Evolutions. Expected release in August. Nationals will be held on July 4th weekend in Indianapolis, IN. JR/SR TCG players must have earned 5 Play! Points to participate. MA TCG players must have earned 10 Play! Points and pay a $30 entry fee to participate. There is currently no Play! Points requirement or entry fee for all players to participate in the VGC tournament. Click on the Tournaments tab for more details. Let me know if you have any questions, and have a wonderful summer! Congratulations to our Xerneas LC Winners! A great showing of 22 players total attended last Saturday, and a big thanks to our Judge Tony Fall and TOM Operator Stephanie Matta for making this event run smoothly! Try out the new Pokémon Battle Trozei! For all you puzzle fanatics, this game is available for download in the Nintendo 3DS e-Shop for $7.99. There are lots of Pokémon to capture in this addicting puzzle game! GA Regionals are coming up! GA Regionals will be held on April 5 (TCG) and 6 (VGC) in Athens. Click on the Tournaments tab for more details. League session WILL be cancelled on this weekend. Put your best TCG deck and/or VGC team to the ultimate test! VGC Regionals will feature play using the X/Y versions. Please read up on the current VGC format to help you prepare your team. Information can be found under the Tournaments Tab. This is a great opportunity for you to experience the World Championships on the East Coast this year. If you want to play for an invite or see what it’s like or take in the sights and sounds of the area, start planning! Let me know if you have any questions, and don’t get fooled by fake Pokémon information on April Fools Day! Try out the new XY TCG set! The set released last Wednesday and is now legal for tournament play. Check out the new powerful EX and Mega Evolution EX cards and build new strategies for your decks! The new Fairy type is also in full swing. This is one set to really get into the game! Both events will be held at HV and be sure to arrive on time for registration (11-11:30 A.M.) Completed decklists will be required as this is a Premier Event. All players will receive one (1) Play! Point and a XY booster pack for participating. Click on the Tournaments tab for more information. Pokémon Bank is now live! Download this app as well as the Pokémon Transporter app for free from Nintendo E-shop to your 2/3DS(XL). With it, this cloud-based service allows you to transfer Pokémon to and from your X/Y version with relatively little risk of losing your favorite Pokémon in the event you lose your game cartridge. You get a 30-day free trial for using Bank before you will be required to pay $4.95 for a yearly access. The Pokémon Transporter will migrate your Pokémon B/W and B2/W2 to Bank and the transfer will be permanent. Major Premier Events are coming up in GA! GA State Championships will be held on March 22 in Duluth, and GA Regionals will be held on April 5 and 6 in Athens. Click on the Tournaments tab for more details. League sessions WILL be cancelled on both these weekends. This is a great opportunity for you to experience the World Championships on the East Coast next year. If you want to play for an invite or see what it’s like or take in the sights and sounds of the area, start planning! Also, for all you Facebook users, you are highly encouraged to join the GA Pokémon Events group by clicking here. Updates are made weekly, and your questions are answered by the GA Pokémon staff and players alike. I will continue to post events on the blog’s Tournaments tab that coincide with the information contained there as a secondary source for you to search as well. Let me know if you have any questions, and have a Happy Valentines Day from myself and the WRAPL staff! 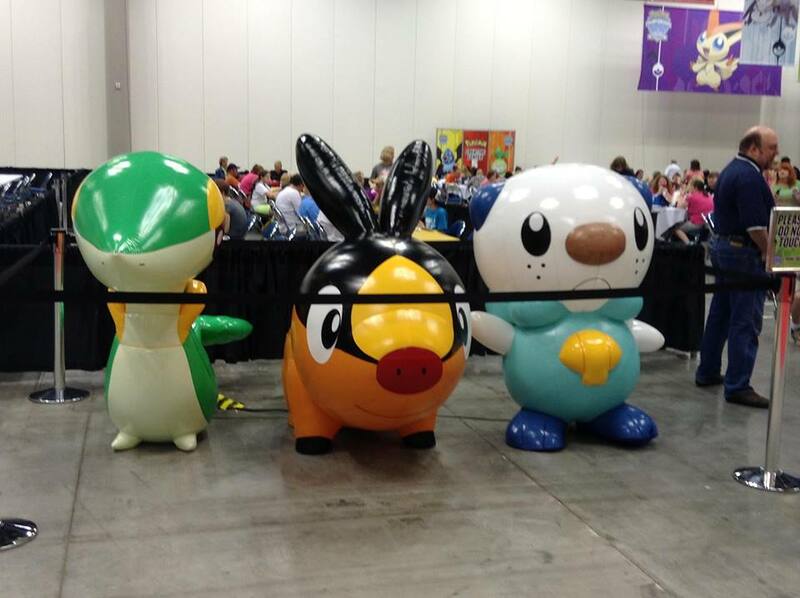 Hey, Trainers! Hope you are having a wonderful holiday season! Congratulations to our League Challenge Winners! Pokémon Bank releases on December 27, 2013! Transfer all your Pokémon from B2W2 to the Bank and to your X/Y versions. Also, get a Celebi just for trying out the Bank! Consider Playing in the GA Cities Marathon this Winter! The event kicks off on December 26th in Statesboro thru January 4th here in WR! Details can be found under the Tournaments Tab. I hope to see you guys come out to these events while I judge a few of them…there are PLENTY of opportunities to load up on Championship Points if you do well, and even win! Winter Regionals are coming up! Put your best TCG deck and/or VGC team to the ultimate test! For the first time, this season’s VGC Regionals will feature play using the X/Y versions. Please read up on the current VGC format to help you prepare your team. Information can be found under the Tournaments Tab. Let me know if you have any questions, and have a Happy Holidays from myself and the WRAPL staff! Hey, Trainers and Happy Halloween!!! Chespin Season is in progress! Supposedly we will get our League Kit for the Chespin Season pretty soon if not already! Order your new badge cases NOW!!! Once you have been added to the roster for attending the Chespin Season, you have the opportunity to order a badge case to be delivered to you as early as the Fennekin Season! Just bear in mind that the badge case is from the previous cycle (B2/W2 Gym) for those of you who somehow didn’t get one in the past. Pokémon X & Y Version Patches are now available! If your game currently suffers from the potentially game-breaking glitch in Lumiose City, please use the camera function on the main menu of your Nintendo 3DS console to download these patches to your respective version game. (Internet connection is required.) 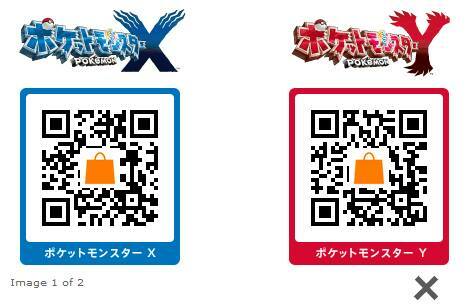 Don’t worry…the patches apply to all XY version games, regardless of language or region the game was purchased! New tournament cycle rules updated! Check the Library tab to view official rules changes (General Event, TCG, VG Rules and Formats). You will be responsible for following these rules when participating at Sanctioned and Premier Events. Consider playing in a Legendary Treasures Pre-Release! It’s not too late to get your hands on the cards early for the upcoming set this weekend in Canton! The set releases on Wednesday, November 6. New TCG Rules updates go into effect on November 8, 2014. -Pokémon Catcher has received an errata that now requires you flip a coin. If heads, switch the Defending Pokémon with one of your opponent’s Benched Pokémon. -Before setup (drawing your 7 cards), players now flip a coin. The winner of the coin flip decides who starts the game first, then both players proceed to set up as normal. The player with the overall first turn of the game cannot attack. –With the release of the Pokémon XY starter decks the same day, the Professor Sycamore supporter card’s effect is identical to that of Professor Juniper. There are no other functional differences; however, both cards cannot be played in the same deck. Your deck must contain either/or should you choose to run any of them. WRAPL is hosting a League Challenge at HV! League Challenges are Premier Events, which give chances to earn Championship Points towards a 2014 World Championships invitation! If this would be your first-ever experience playing in a competitive tourney, a League setting is the perfect place! Please reference League Challenge dates in other locations in GA under the Tournaments tab. I will provide detailed locations of those events upon request. -The event will be held on Saturday, November 16. -Registration starts at 11:00 A.M.
-Entry fee is $5 for all age divisions. All players will receive one (1) booster pack from the currently-released set for participating. -Prizes and Championship Points will be awarded based on division attendance. Top 4 finishers in each age division will receive an exclusive LC Promo. -Format is Modified-Constructed, Single-Game Swiss rounds, 30 minutes “Plus 3,” and ties will be implemented. -A completed Decklist (click to download, then print, fill, and bring with you) will be required to participate. -The new TCG rules updates will be in effect. -Legendary Treasures (LTR) will be legal for play in the LC (not included on the current edition of the decklist I uploaded, but you can include LTR if you use any of those cards). If you have a Facebook account and are logged in, and you are interested in or at least considering attending, please click on this link to the event and RSVP! Full details of the event are listed there as well. Sanctioning permissions have been submitted to TPCi and are currently awaiting approval for the LC designation, so the official sanctioning information is not available at this time. This is a great opportunity for you to experience the World Championships on the East Coast next year. If you want to play for an invite or see what it’s like or take in the sights and sounds of the area, start making plans!